In contrast, there was a an effort to prevent hereditary blindness within the eugenics movement. 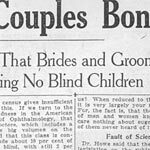 Its proponents collected pedigrees, drafted legislation to prevent marriage of blind individuals, and surveyed ophthalmologists to assess causes of blindness and the cost to society to provide for the blind in specialized homes and schools. Their intent was to eliminate blindness in future generations. However, this was eugenics because affected individuals would not have been allowed to decide for themselves if the trait was undesirable, or what steps to take eliminate it. Explore the Eugenics Archive, especially the “Hereditary Disorders” topic, for many examples of how eugenicists viewed inherited diseases. Print article This entry was posted by Susan Lauter on February 18, 2010 at 12:52 pm, and is filed under Eugenics Archive. Follow any responses to this post through RSS 2.0. You can skip to the end and leave a response. Pinging is currently not allowed.